In April, a team of eight representing Educare Kansas City traveled to the national Educare Learning Network annual meeting hosted by Educare Atlanta. This team of eight included an Educare Kansas City parent, five staff members from Educare Kansas City, and two members of the local evaluation team from Juniper Gardens Children’s Project. This annual meeting provides an opportunity to celebrate accomplishments and explore best practices amongst the 21 Educare schools and their national partners. This year’s meeting also included a national Educare Family Engagement Advisory Group meeting, in which one of Educare Kansas City’s parents participates. Educare Kansas City provides comprehensive, full-day and full-year early education to children ages birth to five in Wyandotte County, KS. The school is managed by Project Eagle of the University of Kansas Medical Center. Educare Kansas City is one of 21 Educare schools in the national Educare Learning Network. This network of schools collectively aims to prevent the persistent achievement gap amongst low-income children. As a member of this network, Educare Kansas City implements four core features: data utilization, high quality teaching practices, embedded professional development, and intensive family engagement. 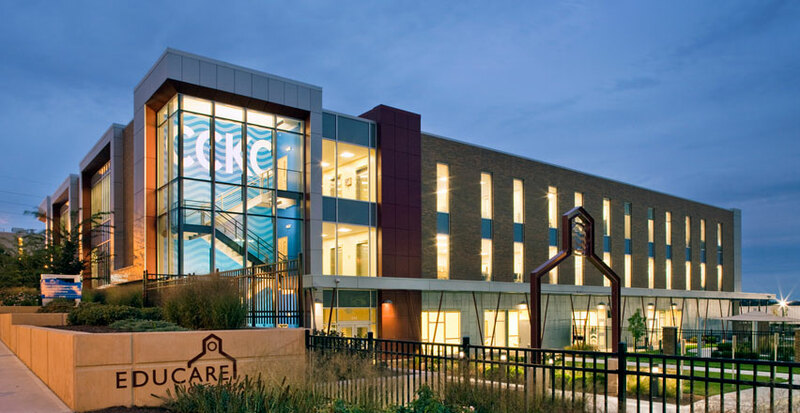 All three Children’s Campus of Kansas City partners play a role in achieving school readiness and positive outcomes for Educare children and families. Realizing that quality early learning programs such as Educare have the potential to improve children’s cognitive, language, and social development in the early years and beyond, Educare of Kansas City, Juniper Gardens Children’s Project, and the Kansas City Kansas Public School District are partnering to follow children who have graduated from the Educare Kansas City School. Children are being followed into Kindergarten, first, and second grade to document the level of school readiness of Educare KC graduates compared to same-age classroom peers who did not attend Educare. This project brings together three Educare Schools to demonstrate the feasibility of implementing an evidence-based language intervention, the Promoting Communication Strategies PC TALK, designed to build the capacity of educators and parents to increase and enhance the language learning opportunities of infants and young children. The intervention is embedded into Educare classrooms in Kansas City, KS; West DuPage, IL; and at Educare Tulsa, OK, and is delivered during parent meetings to extend their “Talking is Teaching” Too Small to Fail initiative. For more information about the Educare Learning Network, please visit: http://www.educareschools.org/top-five-takeaways-educare-learning-network-meeting or contact Heather Schrotberger, Executive Director.